The nursery web spider (Dolomedes minor) is one of New Zealand’s larger spiders, in spite of it’s species name. At this time of the year, it’s also one of the more visible spiders, or at least its webs are. Nursery web spiders don’t use webs to catch food. Instead, they use their silk to create shelters for their eggs and newly-hatched young. These shelters are visible in late summer and autumn on the tips of shrubby plants, especially gorse. The female spider can sometimes be seen hanging around the web during the day. In fact, if she’s nearby, its hard to miss her, with a body nearly two centimetres long, and a leg span reaching six centimetres. The nursery web isn’t the only care the nursery web spider gives her young. 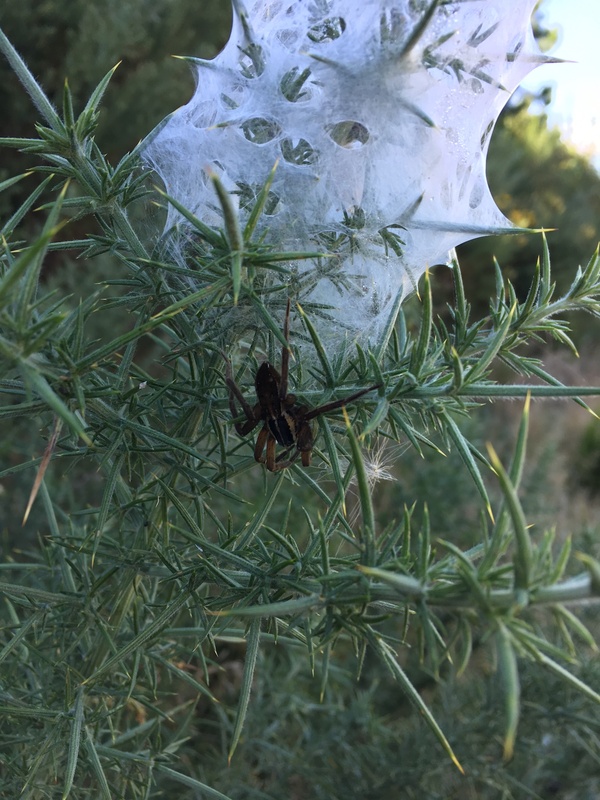 Until the spiderlings are near to hatching, she carries the egg sac with her to protect it. The young hatch out inside the nursery web, staying within the web’s protection for about a week. The spiderlings disperse by ballooning—they let out a strand of silk until the force of the wind blowing on it is greater than their own weight, and then they float away on the end of the thread to a new home. Like other members of the genus Dolomedes, the nursery web spider is an ambush hunter, chasing down its prey on foot. But most other Dolomedes do this exclusively on or in water, whereas the nursery web spider hunts on land as well as water, eating a wide range of invertebrates.